Lynn Hall became a little more colorful this week with the addition of four new beautiful art installations created by students of the College of Veterinary Medicine. 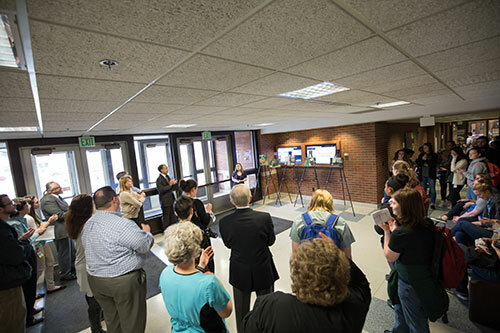 The artwork was dedicated during a ceremony on Tuesday, April 4. The ceremony was led by Dean Willie Reed, who began the concept of the Art in Lynn Hall project seven years ago, with the assistance of Professor of Medical Illustration David Williams. According to Dean Reed, the goal of this project has always been "to fill the walls of Lynn Hall with original artwork." PVM faculty, staff, students and friends crowded together to view the newest additions. Kelsey Trumpp and Rachel Wright, both of the DVM Class of 2019; Katie Sands, of the DVM Class of 2018; and Kara Miller, of the DVM Class of 2017, had their masterpieces dedicated. Both Kelsey and Katie were in attendance for the ceremony. 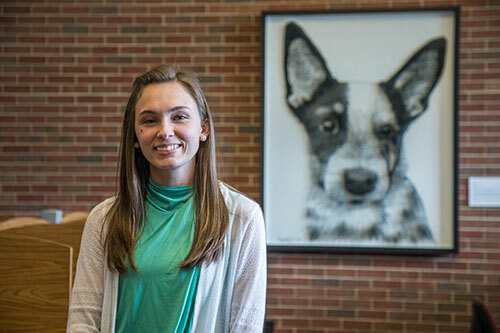 The dedication began in the Veterinary Medical Library where Katie's string art portrait titled "Rue" is displayed. Her portrait was created using a wooden base, nails and string. The strings tie around the nails so that from up close, the portrait appears scattered and chaotic, but from far away, it presents the image of a dog. After a brief introduction from Dean Reed, Katie read her artist's statement aloud. She explained, "Each strand of string blends together to create a portrait that would not be possible without the individual strands. This idea encapsulates the importance of each individual veterinarian to the overall profession, and how their influence can have broader effects than initially perceived." The ceremony then transitioned to the main entrance of Lynn Hall. There, easels were set-up displaying five out of the 11 total photographs taken by Kelsey Trumpp. The series of photos titled, "The Bond We Share", is in reference to the strong bond between humans and animals. The full collection of Kelsey's photography will be installed on the curved hallway behind Lynn 1136. After a kind introduction from Dean Reed, Kelsey also shared her artist's statement, in which she shared, "My hope is that my work inspires people to think outside the box when they look at animals and that they better understand how all life on Earth is intertwined. Additionally, this piece is meant to serve as a reminder to all the students and faculty of Lynn Hall who have dedicated their lives to caring for animals through the veterinary profession that their work is meaningful." Susan Xioufaridou, director of alumni relations and special events, then read aloud the artists' statements for Rachel Wright and Kara Miller who were unable to attend the ceremony. Rachel's window installation, "Flock", is a collection of bird silhouettes adhered to the windows in the Continuum Café and continuing down the hallway behind Lynn 1136. In Rachel's words, "I created this piece of art to reflect veterinary medicine, a profession as diverse, resilient, and adaptable as the birds in this flock." Kara's installation includes a collection of photography featuring her pet Newfoundlands. Kara's statement read, "It is such an honor to have these special moments captured in print to live forever in the halls that so positively shaped my future career." Kara's photographs will be displayed in the Veterinary Teaching Hospital. The full artists' statements will be displayed on a plaque next to each installation. At the conclusion of the ceremony, Dean Reed thanked everyone in attendance, and thanked the students for their hard work and dedication in creating these works of art. He also thanked David Williams for working with the artists and for making the program a success. Plans are already underway for the next segment of the Art in Lynn Hall project with plans to dedicate the artwork in the fall of 2017. Artwork proposals should be sent to David Williams by Wednesday, April 12. Artists selected will then have the summer to complete their work. These talented students have done an incredible job, so be sure to stop by and see their work displayed throughout Lynn Hall! Katie Sands, of the DVM Class of 2018, poses with her string art portrait, "Rue." The portrait can be found on the north wall of the Quiet Study section of the Veterinary Medical Library. PVM faculty, staff, students, and friends gather around the main entrance of Lynn Hall to hear Kelsey Trumpp, of the DVM Class of 2019, speak about her photography collection, "The Bond We Share."